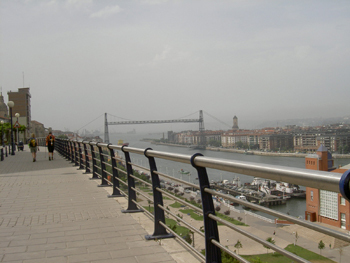 June 13: Bilbao to Portugalete 30392 steps! The walk today was to be primarily flat and short so the start to the day was slow. Leisurely breakfast at the hotel, then hail a taxi to send the four tons of "stuff" on to the next hotel, then discussion as to how to get out of town! 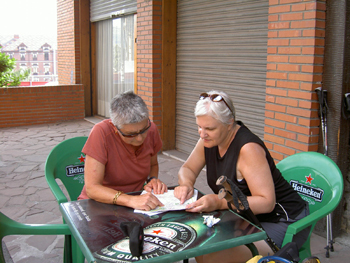 Frankie and Angela were going to ride in the taxi to just outside of town and start from there. The rest of us were going to brave the morning rush hour and trudge through the city. Side note: It is getting very humorous to see the expressions on the different cab drivers as they pull up to the curb and we point to the giant pile of duffel bags. Then the driver tries to lift each one. A true test of the strength of the Spanish will!!! The sky was slightly overcastted as we started which was a joy from days of past in the high heat. A cold front had passed through the day before and dropped the temperatures from 36-38 C degrees to 22 C. It was a welcome relief! The short walk of the day didn't calculate in the hour and half "stroll" around town trying to find the yellow arrows pointing the way out and to the west. Didn't want to go east and repeat! Finally we were on our way seeing our guiding "lights" on almost every corner and turn. Being in the middle of a big city the beginning was on paved sidewalks rambling through one shopping area after another. Then -- that ever present sharp left turn in the middle of the street -- it means only one thing -- up the hillside and fast. This time it was a million and one stairs going straight up through what looked like the projects back home. We couldn't figure out where they put their cars or what the elderly did. Decided that age dictated how high up the slope one lived. As one reached middle age, you were moved down a level or two in exchange for some twenty year olds who wanted a pent house view of the city. All of us being of a more mature age were not sure why we had to go to the top but the Yellow Arrow said so! Bilbao is the major city in this area. We were headed out into the suburbs for tonight so most of our walk was on city streets as the city and its neighboring towns blend into each other. 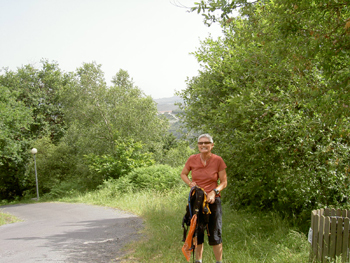 However, as true to the Camino rather than following a straight line, thus being the shortest, the path went high up into the hillsides following farmers' rutted roads and traversed the area from all sides before descending down into the town of Sestao, the neighbor of our home for the night. As we approached we were first confronted by a group of young gypsy women very interested in entertaining us by gyrating their bodies into all sorts of moves. Being a group of women -- we were not impressed! Then as we entered the city limits a young couple with child tried to panhandle us for money in an alleyway, which resulted in a fast pace on our part for several blocks. Panhandlers usually don't scare us, but when we were being somewhat surrounded in a limited space, escape seemed like a more practical thing to do than discuss their economic situation. 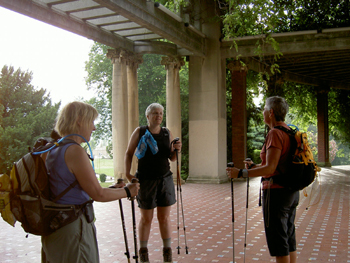 Pilgrims are tough -- especially equipped with poles! Several stops for coke and finally a "daily menu" meal at a small tavern complete with a bottle of wine made the day a lot longer than we had planned, but by far a very enjoyable one. No point getting to the hotel too early. 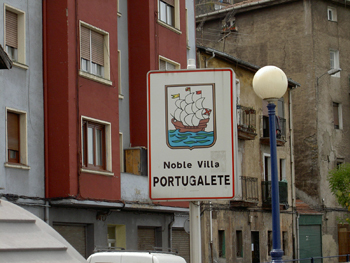 Portugalete is a port town with many of the original medieval buildings still in existence. Our hotel sits on the river leading to the sea with spectacular views of the river boats bringing in the ships. A large promenade passes in front, so people watching is a great way to relax. Two blocks down the promenade is a bridge built by the same man who built the Eiffel Tower -- each end similar in shape, but the section over the river has a ferry suspended on cables that transports the vehicles and people across. Unique, but very interesting to watch. Tomorrow is back to the long walks so a good night's sleep is in order. Everyone's feet are beginning to get use to the pounding, but the tenderness is still there. Oh well, at least we aren't barefoot!! Angela is making great progress -- she walked 15 miles today and is ready to do another tomorrow. Frankie keeps claiming that she is always walking up the mountain, at least twice, and it is snow covered with no down side!! Am not sure what Camino they are walking but they get to the hotel about the same time as everyone else each day and have the same "road weiry" look in their eyes! Which way is out of town? Jan on break! Are we having fun yet?